Prime Minister Narendra Modi’s six-day four nations visit is a major initiative to build a new architecture in the backdrop of a serious challenge to the crumbling post World War II global order. The rapid rise of China and reneging of the US from its international and multilateral commitments, along with Washington’s retreat into bilateralism under US President Donald Trump’s administration, has thrown up serious challenges for world leaders. After the one hour long talks under the framework of India-Germany Intergovernmental Consultations on May 30, global terrorism, climate change, role of free trade, importance of investment protection and bilateral cooperation in skill development, tapping of solar energy and urban development were given special focus. “Pace of development of our relations is fast, direction positive and destination clear. 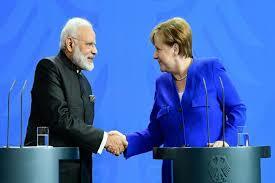 Germany will always find India as powerful, prepared and capable partner,” Mr Modi said at a joint press interaction with Chancellor Merkel. Following talks between the delegations of two countries led by Modi and Merkel respectively, the two sides also signed 12 MOUs/ agreements in areas of cyber policy, development initiatives, sustainable urban development, continued development of cluster managers and skill development, digitalization, railway security and promoting vocational training.